An Alaska Airlines flight from Anchorage to Seattle was diverted back to Anchorage early Wednesday due to a naked passenger on board the jet, airport police said. “There was a subject on the aircraft that had locked himself naked in the the lavatory” Airport Police said. A flight status page on Alaska’s website said the jet had been scheduled to take off at 1:25 a.m., but ultimately left on its scheduled flight at 6:37 a.m.
FBI agents responded to the airport and spoke with the naked passenger. 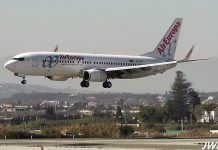 The Boeing 737’s flight crew and other passengers who witnessed part of the incident were also interviewed.